Kurt Cerulli is benefactor of the new Sports Writers Hall of Fame. The important thing, we’re often told, is not whether you won or lost, but how you played the game. Still and all, it’s nice to win one every once in a while. Monday, the man who wrote the poem that gave us that immortal sentiment, the late Grantland Rice, will be one of four preeminent figures honored as the inaugural class of PEN New England’s new Sports Writers Hall of Fame. The event will take place in a ceremony at Fenway Park, where the Red Sox will host a permanent Hall of Fame exhibit in their press room. At its best, sportswriting can cut much deeper than simple analyses of box scores and won-lost records, says Kurt Cerulli, a sports fan, major memorabilia collector, and founder of the new Hall. “To me, great sportswriters aren’t just writing about sports,” says Cerulli, chief executive of Boston-based Cerulli Associates, a financial services firm. They’re capturing vital truths about the culture at large, he says. Cerulli and his wife, Mary, both avid readers, also established PEN’S Cerulli Award for Excellence in Sports Writing, a contemporary honor first given in 2012 to Ben Fountain’s acclaimed debut novel, “Billy Lynn’s Long Halftime Walk.” Last year’s winner was “The Kid,” a comprehensive biography of Ted Williams by former Globe editor Ben Bradlee Jr. This year’s award, which will go to Field & Stream contributor John Gierach for his book “All Fishermen Are Liars,” will be presented in an on-field ceremony before Monday’s game at Fenway. 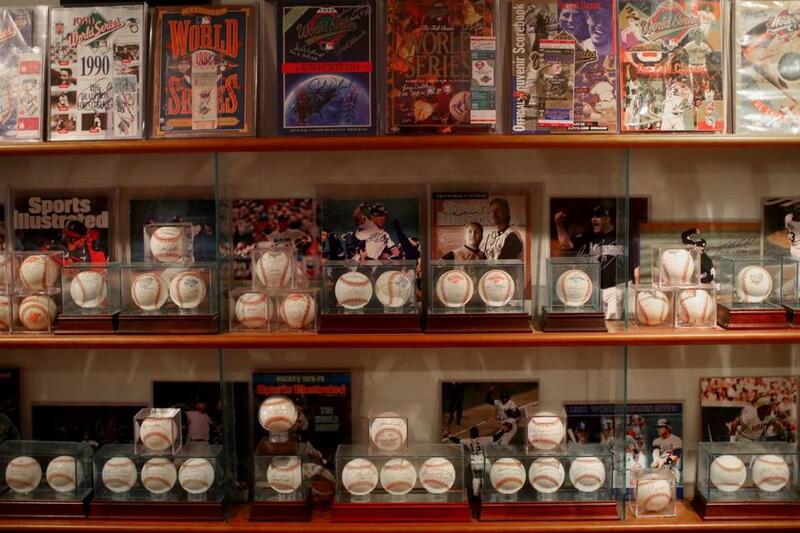 Some of Kurt Cerulli’s sports memorabilia collection will be on display at the Sports Writers Hall of Fame. The selection committee for the Sports Writers Hall of Fame included Sally Jenkins, a Washington Post reporter, and Steve Wulf, a longtime Sports Illustrated contributor who has also served as executive editor of ESPN The Magazine. The process grew heated when discussing some of the great sportswriters who are still living, says Wulf, so they went with the irrefutable legends for the first year. If literature is about telling outstanding stories, Wulf says, the world of sports provides a ready milieu. And it is the writing that will take center stage for the Hall’s opening. PEN New England has acquired first editions, original clippings, and other materials, in some cases from the surviving family members of the four inaugural inductees. The books, plaques, and framed photos on display will become part of the club’s daily, behind-the-scenes Fenway Park tours. Modest at first, the Hall of Fame has the potential to grow quickly, says Cerulli. Cerulli’s own involvement in the PEN projects also had a natural progression. He says that he got hooked on reading as a boy through his daily study of the sports pages. As a PEN supporter, his first conversations with Karen Wulf revolved around their mutual admiration for historians who also write about sports, such as David Halberstam and Doris Kearns Goodwin. So the ideas for the sportswriting award and the Hall of Fame combined his passions for the printed word and for sports. The latter is on full display both at work and at home. The offices of Cerulli Associates, located high above the heart of Boylston Street, feature conference rooms lined with photos, magazine covers, and equipment signed by marquee names in professional sports, from Hank Aaron and Bobby Orr to Tom Brady and Pele. 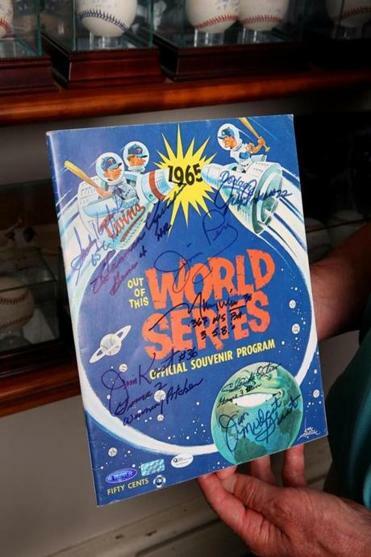 Now he sends memorabilia to agents with specific requests: He’ll pay a living legend like Sandy Koufax or Willie Mays, for instance, to jot down a particular statistic or note an MVP season alongside his signature. For sports fans, it’s impressive stuff. Representatives of the Baseball Hall of Fame have visited. 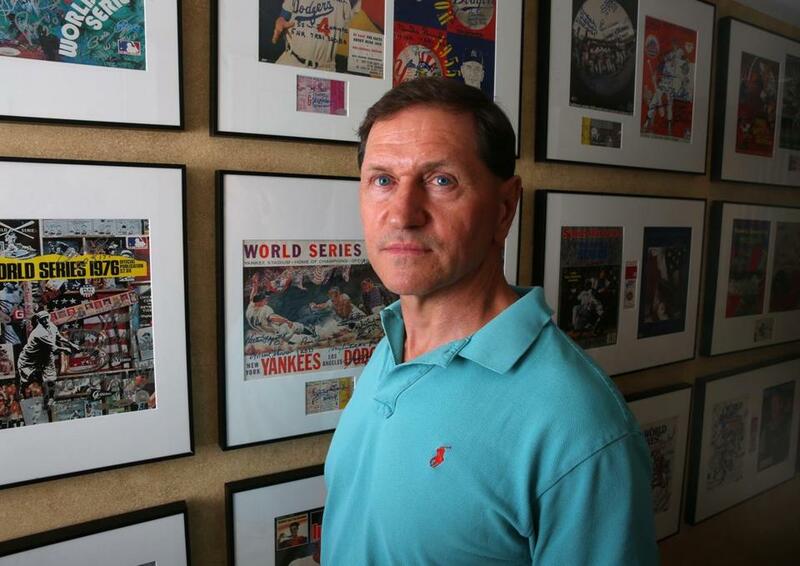 At home in his townhouse, his wife has indulged his passion, making room for many more framed pieces and redesigning a bathroom with the Red Sox logo inlaid in tile and a trough-style urinal like the ones at the Fenway of old. That’s love, says Cerulli, who is the only male in a house with four daughters. And as the founder of the annual Cerulli Award and benefactor of the new Sports Writers Hall of Fame, he’s creating another ode to greatness.